preconceived notions and perceptions can lead to misinterpretation. the villagers told them, "There is an elephant in the village today." They had no idea what an elephant is. They decided, "Even though we would not be able to see it, let us go and feel it anyway." All of them went and touched the elephant. •	"Hey, the elephant is a pillar," said the first man who touched his leg. •	"Oh, no! it is like a rope," said the second man who touched the tail. •	"Oh, no! it is like a thick branch of a tree," said the third man who touched the trunk of the elephant. •	"It is like a big hand fan" said the fourth man who touched the ear of the elephant. •	"It is like a huge wall," said the fifth man who touched the belly of the elephant. •	"It is like a solid pipe," Said the sixth man who touched the tusk of the elephant. They began to argue about the elephant and every one of them insisted that he was right. It looked like they were getting agitated. A wise man was passing by and he saw this. He stopped and asked them, "What is the matter?" They said, "We cannot agree to what the elephant is like." Each one of them told what he thought the elephant was like. The wise man calmly explained to them, "All of you are right. The reason each of you is telling it differently is because each of you touched a different part of the elephant. So, actually the elephant has all those features what you all said." "Oh!" everyone said. There was no more fight. As we apply this to organizations around the globe, we see that it is NOT the people who are blind – they see issues VERY clearly! 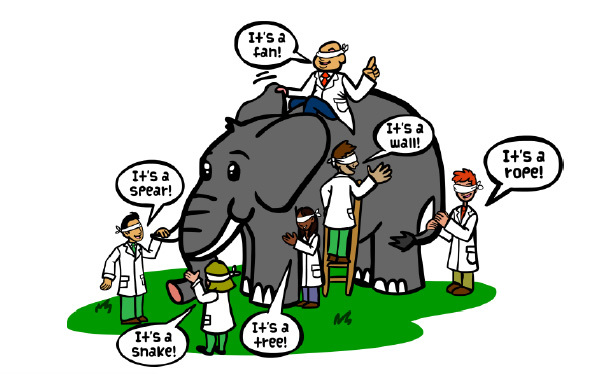 But they see these issues through the lens of their position – Sales, Production, Finance, Logistics, HR…using the elephant metaphor above; it is the organization that is functioning “blindly”.